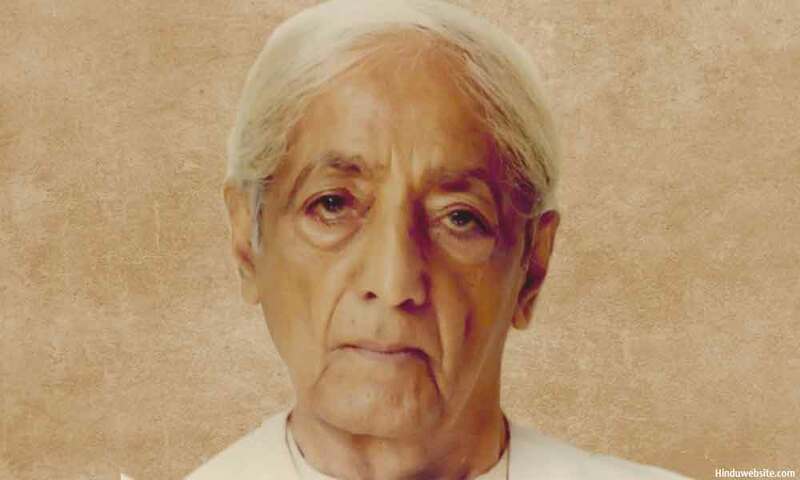 Jiddu Krishnamurti or J. Krishnamurti (May 11, 1895–February 17, 1986), was born in Madanapalle, India and discovered, in 1909, as a teenager by C.W. Leadbeater on the private beach at the Theosophical headquarters at Adyar in Chennai, India. He was subsequently raised under the tutelage of Annie Besant and C.W. Leadbeater within the world-wide organization of the Theosophical Society, who believed him to be a vehicle for a prophesied World Teacher. As a young man, he disavowed this destiny and also dissolved the Order established to support it, and eventually spent the rest of his life travelling the world as an individual speaker and educator with essentially the following message:"Truth is a pathless land", humans cannot come to it through any organization, through any creed, through any dogma, priest or ritual, not through any philosophic knowledge or psychological technique. At age 90 he addressed the United Nations on the subject of peace and awareness, and was awarded the 1984 UN Peace Medal. He gave his last talk in India a month before his death, in 1986, in Ojai, California. His supporters, working through charitable trusts, founded several independent schools across the world—in India, England and the United States—and transcribed many of his thousands of talks, publishing them as educational philosophical books. His official biographer, Mary Lutyens wrote a book about Krishnamurti's early life in India, England, and finally in Ojai, California, entitled Krishnamurti: The Years of Awakening. She was a close associate of his from the Order of the Star, and knew him from the early days until the end of his life. This book contains many insights into this period of his life, about which he rarely spoke. Lutyens wrote three additional volumes of biography: The Years of Fulfillment (1983), The Open Door (1988), and Krishnamurti and the Rajagopals (1996). Additionally, she published an abridgement of the first three volumes, The Life and Death of Krishnamurti (1991). Other published biographies of Krishnamurti include: Krishnamurti, A Biography (1986), by associate Pupul Jayakar and Star In the East: Krishnamurti, The Invention of a Messiah (2002), by Roland Vernon. He was born in a small town about 150 miles (250 km) north of Madras, India. His birthdate has been also stated as May 12, however Mary Lutyens, points out, that the Brahmin day is calculated from dawn and he was born at 12:30 AM, so therefore on May 11. It's only the Western world who would state this was May 12. "As an eighth child, who happened to be a boy, he was, in accordance with Hindu orthodoxy, named after Sri Krishna who had himself been an eighth child." "Narianiah, though an orthodox Brahmin, had been a member of the Theosophical Society since 1881 (Theosophy embraces all religions)." (Lutyens, p 7). This was while Helena Blavatsky was still its head in India. Narianiah had retired at the end of 1907 and wrote to Annie Besant to recommend himself as a caretaker for the 260-acre Theosophical estate at Adyar. He had four boys and Annie thought they would be a disturbing influence and so turned him down. He continued his requests and finally was accepted as an assistant to the Recording Secretary of the Esoteric Section. His family which included, himself, his four sons, and a nephew moved there on Jan 23, 1909. It was a few months after this last move that Krishna was discovered by C.W. Leadbeater. One evening, C.W.Leadbeater went with his young assistants to the beach to bathe. On returning he told his assistant Ernest Wood that one of the boys on the beach had the most wonderful aura he had ever seen, without a particle of selfishness in it. It could not be Krishna’s outward appearance that struck Leadbeater for apart from his wonderful aura, he was not at all impressive at that time. This is how Krishnamurti was discovered by the Theosophists in 1909. Hubert and Mrs Van Hook, his mother, also arrived at Adyar and stayed there for some time. Krishna (or Krishnaji as he was often called) and his younger brother Nitya were educated at the Theosophical compound and later taken to England to finish their education. His father, pushed into the background by the swirl of interest around Krishna, ended up in a lawsuit against the Society to try to protect his parental interests. As a result of this separation from his family and home, Krishnamurti and his brother Nitya became extremely close and in the following years they often travelled together. Mary Lutyens states that there came a time when Krishnamurti fully believed that he was to become the World Teacher that he had been told, after correct guidance and education, he would become. However, the unnexpected death of his brother Nitya on November 11, 1925 at age 27 from tuberculosis, fundamentally shook his belief and faith in the divine 'Masters', and the leaders of the Theosophical Society. (Crucially, though he later abandoned the society, he was never to explicitly deny his role of 'the World Teacher' which had been foreseen. Typically he would prefer to discuss directly the fundamental problems effecting mankind rather than such grand and imposed notions - no matter how essentially true they may have been.) He had prayed directly to the Masters for his brother's life to be spared but it was not. The experience of his brother's death shattered his remaining illusions. He died; I wept in loneliness. Where'er I went, I heard his voice and his happy laughter. I looked for his face in every passer by and asked each if he had not met with my brother; But none could give me comfort. I worshipped, I prayed, But the gods were silent. I could weep no more; I could dream no more. I sought him in all things, in every clime. I heard the whispering of many trees Calling me to his abode. And then, in my search, I beheld Thee, O Lord of my heart; In Thee alone I saw the face of my brother. In Thee alone, O my eternal Love, Do I behold the faces Of all the living and all the dead. From 1925 onward things were to never be the same again. In 1925, he was expected by Theosophists to enter Sydney, Australia walking on water, but this did not eventuate and he visited Australia the following year by ship. You may remember the story of how the devil and a friend of his were walking down the street, when they saw ahead of them a man stoop down and pick up something from the ground, look at it, and put it away in his pocket. The friend said to the devil, "What did that man pick up?" "He picked up a piece of the truth," said the devil. "That is a very bad business for you, then," said his friend. "Oh, not at all," the devil replied, "I am going to help him organize it." After disbanding the Order of the Star and drifting away from the Theosophical Society, its belief system and practices, Krishnamurti spent the rest of his life holding dialogues and giving public talks across the world on the nature of belief, truth, sorrow, freedom, death and the apparently eternal quest for a spiritually-fulfilled life et cetera. Following on from the 'pathless land' notion, Krishnamurti accepted neither followers nor worshippers, seeing the relationship between disciple and guru as encouraging the antithesis of spiritual emancipation - dependency and exploitation. He constantly urged people to think independently and clearly and to explore and discuss specific topics together with him, to "walk as two friends". He accepted gifts and financial support freely offered to him by people inspired by his work (his main residence being on donated land in Ojai, California) and relentlessly continued with lecture tours and the publication of books and talk transcripts for more than half a century. Later years and "farewell talks"
"So we are inquiring what makes a bird. What is creation behind all this? Are you waiting for me to describe it, to go into it? ... Why? Why do you ask [what creation is]? Because I asked? No description can ever describe the origin. The origin is nameless; the origin is absolutely quiet, it's not whirring about making noise. Creation is something that is most holy, that's the most sacred thing in life, and if you have made a mess of your life, change it. Change it today, not tomorrow. If you are uncertain, find out why and be certain. If your thinking is not straight, think straight, logically. Unless all that is prepared, all that is settled, you can't enter into this world, into the world of creation." "This is the last talk. Do you want to sit together quietly for a while? All right, sirs, let us sit quietly for a while." J. Krishnamurti passed away one and a half months later at the age of 90 from pancreatic cancer. His remains were cremated and scattered by friends and former associates in the three countries where he had spent most of his life, India, England and United States of America. The core of Krishnamurti's teaching is contained in the statement he made in 1929 when he said: 'Truth is a pathless land'. Man cannot come to it through any organization, through any creed, through any dogma, priest or ritual, not through any philosophic knowledge or psychological technique. He has to find it through the mirror of relationship, through the understanding of the contents of his own mind, through observation and not through intellectual analysis or introspective dissection. Man has built in himself images as a fence of security — religious, political, personal. These manifest as symbols, ideas, beliefs. The burden of these images dominates man's thinking, his relationships and his daily life. These images are the causes of our problems for they divide man from man. His perception of life is shaped by the concepts already established in his mind. The content of his consciousness is his entire existence. This content is common to all humanity. The individuality is the name, the form and superficial culture he acquires from tradition and environment. The uniqueness of man does not lie in the superficial but in complete freedom from the content of his consciousness, which is common to all mankind. So he is not an individual. Freedom is not a reaction; freedom is not a choice. It is man's pretence that because he has choice he is free. Freedom is pure observation without direction, without fear of punishment and reward. Freedom is without motive; freedom is not at the end of the evolution of man but lies in the first step of his existence. In observation one begins to discover the lack of freedom. Freedom is found in the choiceless awareness of our daily existence and activity. Thought is time. Thought is born of experience and knowledge which are inseparable from time and the past. Time is the psychological enemy of man. Our action is based on knowledge and therefore time, so man is always a slave to the past. Thought is ever-limited and so we live in constant conflict and struggle. There is no psychological evolution. When man becomes aware of the movement of his own thoughts he will see the division between the thinker and thought, the observer and the observed, the experience and the experiencer. He will discover that this division is an illusion. Then only is there pure observation which is insight without any shadow of the past or of time. This timeless insight brings about a deep radical mutation in the mind. A tremendous volume of material exists documenting the philosophical investigations of Krishnamurti (or simply "K" as he is sometimes referred to) mostly in the form of recorded conversations and talks, although K also wrote several series of short essays and kept a personal journal at least twice in his life. He had dialogues and personal meetings with a wide variety of people from all kinds of backgrounds. An example of the far-ranging and probing dialogues he had is a series of conversations recorded in 1980 with theoretical physicist David Bohm that resulted in the publication of The Ending of Time and The Future of Humanity. These conversations are also available on audio tape and a subset of them on video and DVD as well. Two conversations with Swami Venkatesananda in Saanen explore the role of the guru and the fundamental paths of Hinduism. These conversations are also available on audio tape. Questioner: "I have listened to you for many years and I have become quite good at watching my thoughts and being aware of every thing I do, but I have never touched the deep waters or experienced the transformation of which you speak. Why?" Krishnamurti: "I think it is fairly clear why none of us do experience something beyond the mere watching. There may be rare moments of an emotional state in which we see, as it were, the clarity of the sky between clouds, but I do not mean anything of that kind. All such experiences are temporary and have very little significance. The questioner wants to know why, after these many years of watching, he hasn't found the deep waters. Why should he find them? Do you understand? You think that by watching your own thoughts you are going to get a reward: if you do this, you will get that. You are really not watching at all, because your mind is concerned with gaining a reward. You think that by watching, by being aware, you will be more loving, you will suffer less, be less irritable, get something beyond; so your watching is a process of buying. With this coin you are buying that, which means that your watching is a process of choice; therefore it isn't watching, it isn't attention. To watch is to observe without choice, to see yourself as you are without any movement of desire to change, which is an extremely arduous thing to do; but that doesn't mean that you are going to remain in your present state. You do not know what will happen if you see yourself as you are without wishing to bring about a change in that which you see. Do you understand? I am going to take an example and work it out, and you will see. Let us say I am violent, as most people are. Our whole culture is violent; but I won't enter into the anatomy of violence now, because that is not the problem we are considering. I am violent, and I realize that I am violent. What happens? My immediate response is that I must do something about it, is it not? I say I must become non-violent. That is what every religious teacher has told us for centuries: that if one is violent one must become non-violent. So I practise, I do all the ideological things. But now I see how absurd that is, because the entity who observes violence and wishes to change it into non-violence, is still violent. So I am concerned, not with the expression of that entity, but with the entity himself. You are following all this, I hope? So, the questioner wants to know why it is that he cannot go beyond all these superficial wrangles of the mind. For the simple reason that, consciously or unconsciously, the mind is always seeking something, and that very search brings violence, competition, the sense of utter dissatisfaction. It is only when the mind is completely still that there is a possibility of touching the deep waters." 6th public talk Ojai, 21st July 1955 from the booklet "Surely, Freedom From the Self is the True Function of Man". "So, to meditate is to purge the mind of its self-centered activity. And if you have come this far in meditation, you will find there is silence, a total emptiness. The mind is uncontaminated by society; it is no longer subject to any influence, to the pressure of any desire. It is completely alone, and being alone, untouched it is innocent. Therefore there is a possibility for that which is timeless, eternal, to come into being. This whole process is meditation." A good "first book" to gain an understanding of his teachings is Freedom From the Known, San Francisco: Harper & Row, 1969, ISBN 0-06-064808-2.